I DONT KNOW WHO HUGO IS, BUT THEYRE MY HERO. HUGO, I WANT - ProudMummy.com the Web's Community for Mums. I DON'T KNOW WHO HUGO IS, BUT THEY'RE MY HERO. HUGO, I WANTED TO FOLLOW UP AND SEE WHAT YOU NEEDED FROM ME TO GET GOING ON WHAT YOUR FITNESS GOALS. WHAT CAN I DO TO HELP? 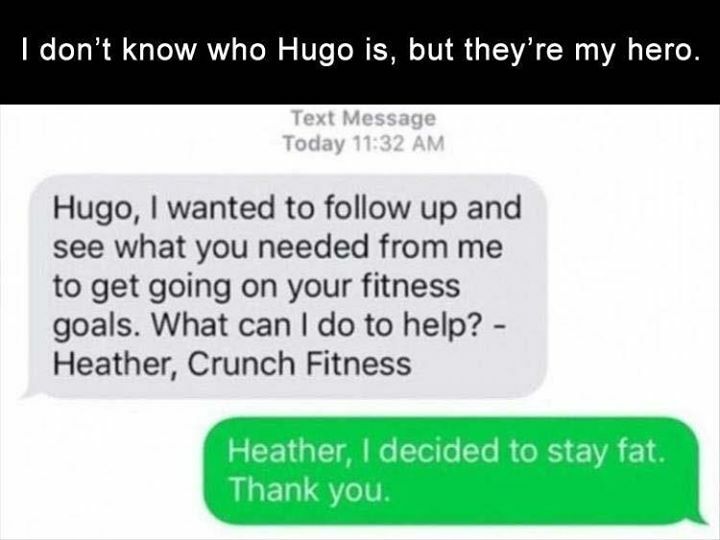 - HEATHER, CRUNCH FITNESS HEATHER, I DECIDED TO STAY FAT. THANK YOU.